Since this post has the right title and is still getting many views, this is the right place to put a different article not yet written, that best explains how we can know, for fairly sure, that neither Russia nor Syria had a hand in attacking that aid convoy back on September 19, 2016. I re-named and moved the previous article to "Did the Russians Slant Gravity?". The space below will contain a summary of the evidence per our findings and others', and links to the few posts here. - Did the Russians Slant Gravity? - "Humiliating Aid" Rejected by Whom? 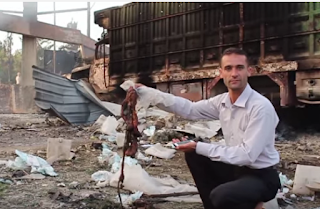 Rebels staged this supposed blast of a Russian OFAB-250 bomb. Not a good sign. Also, they might have fired the actual weapon used here, from nearby to the south (see did the Russians slant gravity?). At least five cases of what seems like paper signs torn off the aid trucks by hand in areas of little damage. ... see the "humiliating aid" article for context. 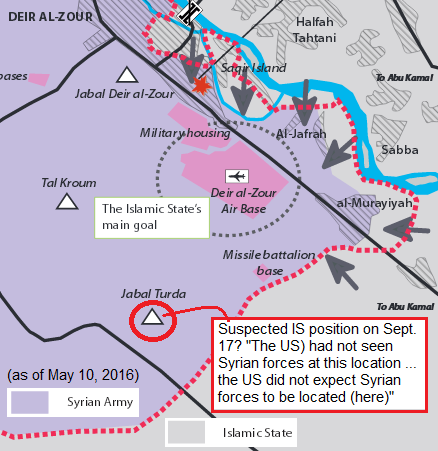 I initially brought this up at A Closer Look On Syria, but finally expanded it the what follows. Black Magic, Just Stumbled Upon? 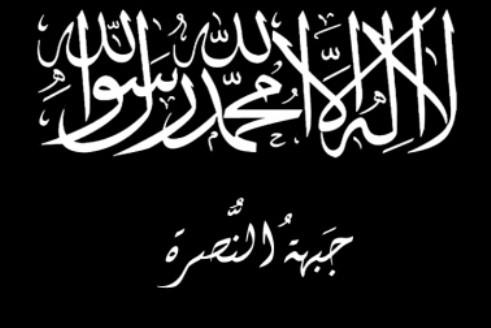 From part 2, on how first al-Nusra and later (by inheritance) Islamic State got their chemical weapons: it happened "roughly four months before the split between the Nusra Front and ISIS, in December 2012" (not an enemy split - they worked together on various massacres through 2013 before major infighting started almost a year afyer this). But at the time, JaN was a powerful force including everyone who would switch to ISIS). Islamist rebels led by them had taken Darat Izza, near Aleppo, over the summer, and had since then besieged the base of army Regiment 111, aka the Sheikh Suleiman base. 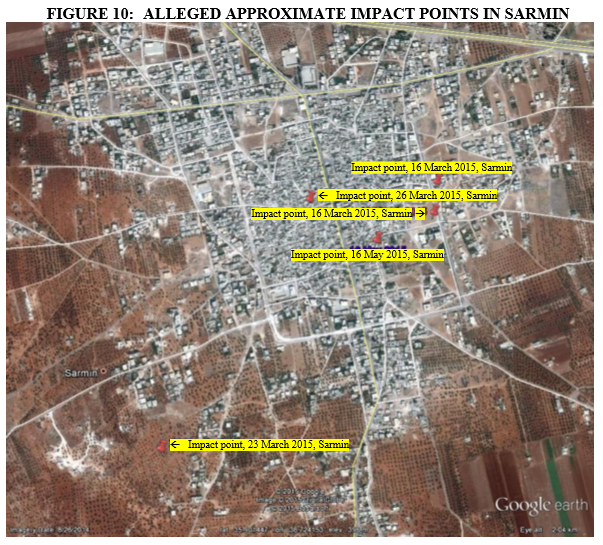 "Three months later, both the Syrian government and rebel groups reported an attack in Khan al-Assal, near Aleppo...."
This attack of March 19, 2013 (ACLOS) apparently involved both chlorine and sarin. I understand they don't mix well, but there were several rockets, at least one each probably delivered each chemical separately. The only basis for chlorine is a reported smell, but that's good enough. However, it's secondary to the sarin apparently also delivered - Syrian and Russian tests showed sarin in the dead, and the large toll and manner of death (dropping dead on the spot) are far more consistent with sarin than with chlorine. The explanation of Die Welt reporter, that al-Nusra Sarin's was different from Syrian government Sarin, is also dubious. 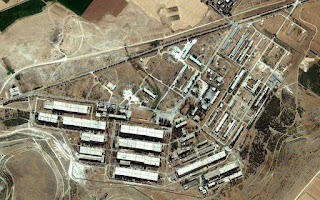 According to a recent extensive report based on interviews with an al-Qaeda aligned "rebel" in Syria, al-Qaeda acquired the Sarin from a storage facility of the Syrian regime when it conquered the Syrian base of Regiment 111 in late 2012. This was before the split of al-Nusra and the Islamic State. There would thus be no difference between "regime Sarin" and "al-Qaeda Sarin". Previously, several clues have suggested a distinct and important difference between the sarin types. So far all tests on sarin used in the war seem (by direct findings or by awkward silence) to be non-professional grade, not government stocks, un-stabilized, impure, and with a short shelf life. But it's been used consistently from at least March 2013 to February 2015, with Syria supposedly surrendering its own stocks in between. That certainly shouldn't be tossed just because of this new claim, as tempting as that might be crafted to be. This could be the valid clue some will take it for, but it could be disinformation. My causes for doubt and the reasons seem worth sharing here. In other words, "As long as someone else criminally used it first, we can criminally use it once we take it. "This really might be worth fabricating a story over. Why Would it be There? Sarin, briefly; this is allegedly available by one or another of several avenues (precursors in Turkey, smuggled from Libya, from Iraq, etc. ), with no need to seize more ready-made. But of course, they'd take it if they found it. But chlorine? At a weapons research or just storage facility? It's accepted by many they do use it, but this is supposed to be reality-based claim, and chlorine as a weapon still makes no sense. The opposition frames it as a "psychological torture" that could be countered by education, or a "no fly zone," and they prefer the latter. And the government always said it was careful about its possible CW stocks, not to let them get in jihadist hands. And that only makes sense, right? This base was under attack for months - the area was conquered in August, but not the base - evacuating people and material might be difficult after this, but not before. Yet three months later, they've still got these deadly chemicals - sarin! - sitting there to be found as soon as it's all overrun? And they never, for example, used them against the attackers? Dec 9 report (The National.ae), said the base was largely conquered "yesterday." So on December 8, according to SOHR director Rami Abdel Rahman said. "The rebels took control of Regiment 111 and three other company posts located inside the base after fierce fighting overnight, the Syrian Observatory for Human Rights said. "Two rebels and one soldier were killed, while five soldiers were captured. ..." This was the final capture, with only some mop-up remaining. As for where this alleged research center was - looking at the area on Wikimapia, it almost has to be amongst the underground bunkers. Otherwise, the base area looks like simple army terrain with nothing but a few sheds and dirt roads. Externally, only the Hammiko company grounds just to the west could be some kind of real facility. The timing of this release, in context, raises questions. It could be to say hey, it doesn't matter where they get their chlorine, just as they were reportedly getting it in a big way. "Terrorist groups may resort to using chemical weapons against the Syrian people... after having gained control of a toxic chlorine factory" east of Aleppo, the (Syrian) foreign ministry said... The ministry was believed to be referring to the Syrian-Saudi Chemicals Company (SYSACCO) factory near Safira, which was taken over earlier this week by militants from the jihadist Al-Nusra Front." "Earlier this week" would be between Dec. 1 and 8, more likely the second half but not "yesterday," so Dec. 4-6. Note this. A fascinating report on the plan seizure: The Mystery Behind a Deadly Chemical Attack By Aryn Baker, Time, April 1, 2013. Following the March, 2013 chemical attack in Khan al-Assal, Baker interviewed Mohammad Sabbagh. "[A]s the owner of Syria’s only chlorine-gas manufacturing plant, Sabbagh knew that if chlorine was involved, it most likely came from his factory." In August, she heard, "rebel forces took Sabbagh’s factory by force, as part of a sweep that also netted them an electricity station and a military airport about 30 km from Aleppo." From exile in Beirut, Sabbagh " says his factory is now occupied by Jabhat al-Nusra," taken over by agreement presumably. Sabbagh says the plant was no longer producing chlorine, but that could have changed. 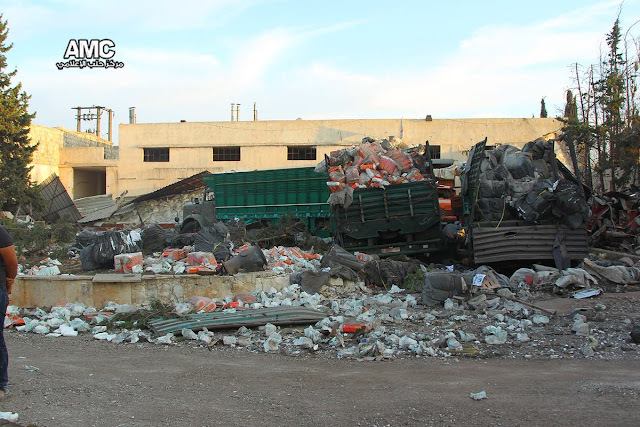 As of 2016, the al-Safira area and this plant are back in government hands. But at the time it mattered, there was a lot already made. Further, we can note it got in the hand of those terrorists, by their decision, about a day or two after Obama issued his red line offer a second time to show he meant it, on December 3. Al-Nusra takes over the chlorine plant probably between December 4 and 6, then the first clearly-reported chemical attacks of the war emerged on December 6 and 8, then Dec 22 and 23, with both sides attacking/blaming each other. These were far from Aleppo, in Homs and Damascus. But ... at least one of these attacks apparently used chlorine, deployed by rebels, that reportedly killed seven SAA soldiers. That was in Daraya, Damascus suburbs, on December 8. The same day Syria decries a dangerous seizure of chlorine in Aleppo, other terrorists kill their soldiers with the same stuff clear across the country. What does this mean? Some will wonder if the government claim of the SYSACCO plant seizure was a lie - knowing their base with the chemicals was overrun on the 8th, they quickly highlighted just the chlorine part, blaming the chlorine factory, which, it seems, was also taken over at some point ( we don't know when, and if Sabbagh's claim is a lie, we don't know if it was occupied at all) The motive would be to keep any heat off themselves. That's possible, but I don't think it's likely. Let's consider where chlorine was reportedly seized the factory vs. the base overrun just after- some distance northwest or southeast of Aleppo, which is itself a big city. The initial reports mentioned five soldiers were captured and, per the SOHR (that is, according to claims lodged originally by the Islamist fighters) they were saying "140 of their men had fled to the scientific research centre on the base," perhaps to guard the unknown chemical weapons. Does this lend support to the new claim, that it was true all along? It might. But it might be an untrue claim. Maybe the interrogators feeding the prisoners their lines (or just making the lines up?) wanted us to know they might claim to finding unspecified CWs there. They probably knew that would include chlorine, as al-Nusra was on its chlorine-gathering spree and others were synthesizing it, with intent to use ... here they have soldiers in their custody sowing clues that this might all be "Assad's CWs" to begin with. They say some 140 soldiers had retreated here to guard it. Maybe some 140 were massacred and dumped in a spot to help prove the point. I've had an incident on file for some years that comes to mind recently, as Syria's emergency workers are getting some long-deserved attention as the "real civil defense," in a multi-part article by Vanessa Beeley at 21st Century Wire (the rather amazing part 1 is available here). This possibly related scene is captured in a terrible video called "GRAPHIC Assad´s Syrian army soldiers beating a handcuffed man to death," published on Youtube October 15, 2012. Other copies have gone missing, so in case they all do, I have a saved copy of this, and present the most important screen grabs here. This shows a bound man, beaten and bleeding, with a wrapped head, in the custody of men in camouflage fatigues and varied footwear. One grabs the man by his feet and drags him some distance face-down, then into the bed of a pickup truck (Toyota). The poor victim is mostly motionless but alive. One apparent soldier kicks him hard in the face, and he's last seen hanging over the tailgate, breathing hard or sobbing. 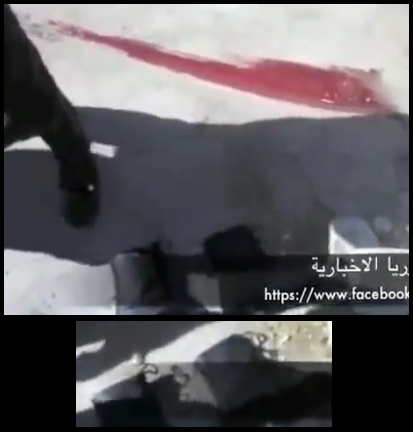 This depraved and inhumane sequence is just one of hundreds upon hundreds of alleged regime crime videos, self-documented for fun, that opposition "activists" managed to own. We presume there are thousands more theyhaven't got copies of right? Or, hopefully, this is most of them, and they get so many because of their direct links to the responsible gunmen. Sometimes the videos are described as "leaked," sometime taken from the cell phone of a soldier or Shabih killed or taken captive. Usually it's not even explained how - they just got it and it's total proof. They go on Youtube and shock some into supporting anti-government forces, and may send other useful signals to other people. Some are pulled for being too graphic and "disgusting." As usual in such productions, the prominently displayed callous behavior suggests the perpetrators are trying to make themselves look bad. Or, since people don't usually do that, maybe they're trying to make someone else look bad. Since they're in Syrian army uniforms, they would be trying to make the army look bad. Note the disciplined salute at 0:07 as the "captain" of this operation walks up. Clearly approved at the highest levels this was! I don't know of any white-and-black wristband connected to Al-Qaeda activity, just some kind of watch, supposedly. But it could be. The brief view of one "soldier's" left wrist is shown here for reference. All considered, maybe these Islamist defectors remembered not to takbeer, but forgot to lose all the wristbands, in their effort to make their uniforms seem not stolen. The first oddity is the victim's removed footwear - strange boots with loops at the top, looking like dark rubber, pull-over units, like firefighters use. It's not the stylized yellow units shown in Beeley's piece, but worth noting. His pants are not inconsistent, and his bald-headed haircut seems likely (to me, anyway) for a firefighter. Even the shovel we see could be a fire fighter's - it's with him and his boots. As the victim is dragged off, leaving a blood smear, someone picks it up to bring it with them. Do they plan to bury this fireman with his own shovel? As he's dragged face-down, we see a parked fire engine. There's a smaller red truck sits near a larger red truck with double wheels in the back, and tanks beneath. The ground is wet all around it (but dry everywhere else). Briefly we also see the end of this vehicle, with a ladder up one side. Clearly, these "soldiers" have themselves a fire truck. I can't make out any identifying numbers to help identify this. But I'd love to hear the other side of what happened to that crew. Now, ask - why would regular army units need to call in a fire at some remote-seeming area and have responders sent to ambush them? They could kill firefighters other ways, arrest them right at the station and take them to a secret prison, etc. They wouldn't do this to steal a fire engine either, having powers to get one officially if they wanted to. Uniforms and weapons considered, this is best explained by defectors working outside the state system, calling in a fire (as we'll see, they'd dial 113) and preparing an ambush there instead. The whole crew must be somewhere, perhaps being held for ransom. It's likely the rest were Sunnis and this one was found to be Alawi, and sentenced to death over it. Different posting clues suggest the scene happened before October 15, 2012, perhaps in Baniyas province (A pulled posting was included here as Assad’s forces torture a man in Banyas, Tartous) - I checked the VDC database: no clear matches on people from Tartous province. A few possible matches, none linking to this video or specifying fireman. 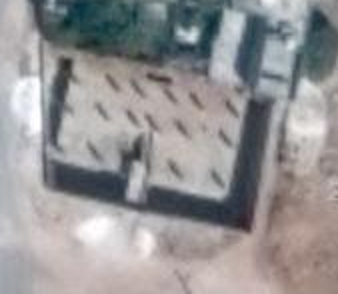 There are eight unidentified men executed 10-11, from Reihaneih ( الريحانية ) Tartous (I cannot locate such a place, at least not anywhere near Baniyas - not sure of all province boundaries). Some other unidentified men had been shot there earlier as well. Ja'far al-Qadri from Damascus suburbs, area killed not mentioned (might be the same). Killed by shooting 2012-10-09 "By regime forces gunfire," of course. Moawyah Abdullah Hoshan - a fireman from Kafr Zita Hama, killed by shooting 2012-09-23 in Aleppo. Notes: "He was martyred by regime forces' gunfire due his duties." Called to a fire and killed by men in uniform - that could be this scene. I'll add his name Muawiyah is one Alawites would be unlikely to use (Wikipedia). Also, that might be why the killers chose it as a replacement name. We don't know if any of that record is accurate. So there's no reasonably clear match, but either might be it, and the Aleppo entry especially is compelling. Good question. I guess the "Free Syrian Army" calls for you when it's needed? 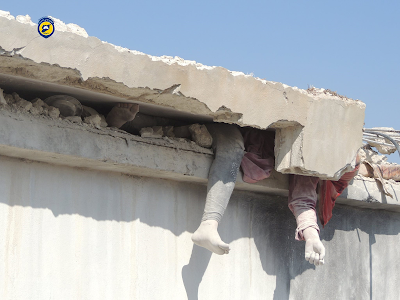 The non-Syrian civil defense folks would say half-jokingly they just run towards explosion sounds, without fear. And that's the most serious they'd get. Like anywhere, they probably handle all kinds of other emergencies. Perhaps also "civil defense" is another level up from regular fire - like the police can call in the army if needed. Either way, this probably is the closest equivalent to the lauded "White Helmets," and therefore the real Syrian civil defense. Civilly, they work with the sovereign government, not with a cluster of interventionist forces backing the Sunni-extremist-identifying replacement for "liberated" areas, that also does things like execution cleanup, running with babies, and saying "barrel bombs" almost as often as "Allahu Akbar." Beeley spoke with some of the real real civil defense workers in Aleppo, whose helmets tend to be yellow, not white. One dubbed ‘Khaled’ (for safety) told her "what happened when the terrorists (western media still call them “opposition” or “moderate rebels”) started to invade East Aleppo in 2012." I hear the three trucks were stolen in from one captured station, so the engine seen above - intercepted and possibly kept by those "soldiers" - won't be one of them. But there were probably more than those three seized. That is, if this is Aleppo. The same thing surely happened in other cities as well. The time frame is right - summer and fall is when the rebel takeover there really kicked off. 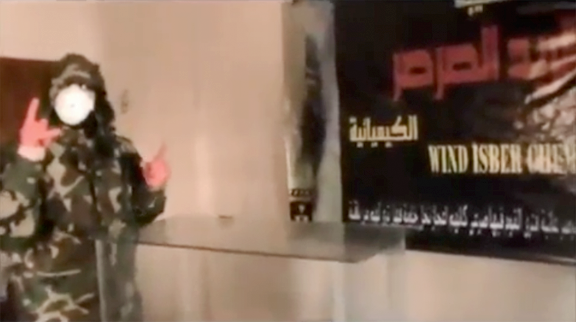 The infamous al-Nusra soldier execution scene (right) was in early September. This shocked many people, because it was clearly the anti-government forces being criminals here. Up to that point, it seemed, only the regime's forces were yanking people - including soldiers, police, and firemen - into the shadows and murdering them on what would wind up as opposition propaganda videos. Notes: Sept. 21: This seemed urgent enough to rush a bit and post it with typos, incomplete spots, and probably a few things I forgot, or don't know yet. I'll make it a short 2-3-days-til done post, and plan for a part 2 fairly soon after. Sept. 22: Since this is getting viewed around (example: slightly different unauthorized but a-ok re-post of the rough version at 21st Century Wire !) ... I should get this finalized quick. Sept. 25: Finally added notes and stuff. See Sept. 25 below. 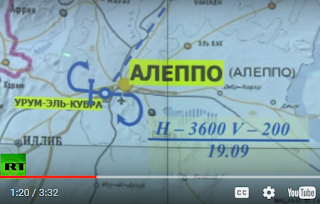 Sept. 30: This being about questioning the Russia blame, a sort of part 2 relates a simple proof that the best proof of Russian bombing actually proves local rebels were behind at least some of the firing. On September 19, someone attacked a convoy of trucks delivering aid to a rebel-held area of rural Aleppo province. Anti-government activists were emphatic there were helicopters dropping barrel bombs, and perhaps surface-fired missiles, followed by fighter jet strikes, which also used cluster bombs and-or machine gunned the area, keeping rebel help at bay so more witnesses would bleed to death. We know this? It's not explained how. It sounds like the model of aircraft isn't known, nor whose they were, just that they were present, in the air, and not ours. 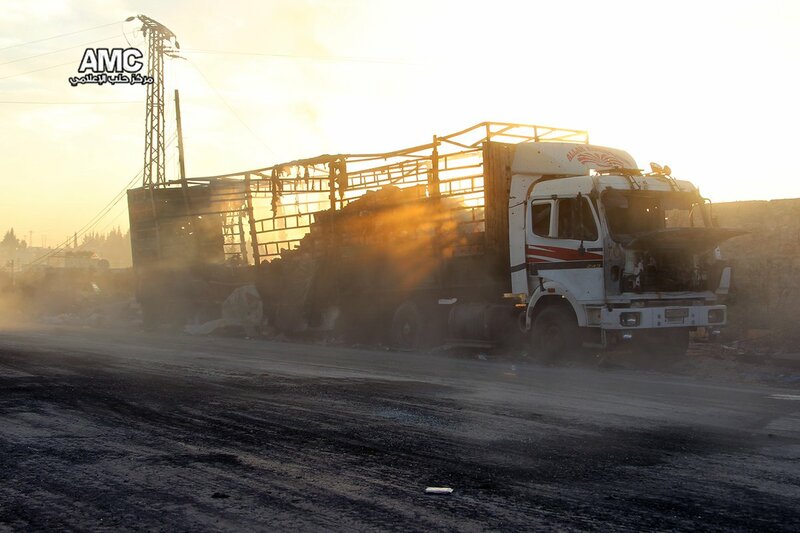 But another unnamed official said "two Russian SU-24 attack aircraft were in the sky above the convoy at the precise moment it was hit in Urum al-Kubra." (BBC) This sounds like detailed findings including radar, but it could also be just empty words. The official also noted the strike "was too sophisticated to have been carried out by the Syrian army." Is it really excess sophistication? Or just that they just want to blame Russia specifically at this time? There will be no radar proof brought forth, probably because they were watching and saw no movements. Most likely, this is nothing but circular reasoning - there was an alleged airstrike that must have been the Russians, and they would use SU-24 jets, as usual, operating in pairs. But it will be read as independent proof. "it happened while Russian jets were overhead? Obvious Putin crime! The point is - we can't trust Washington's unnamed officials when they say what they believe to be the case. They're telling us to believe their mistake story, but they don't swallow that poison themselves. So, are they lying here as well? Especially when that lie would come so soon after and helps distract from the above-mentioned incident? "There are no craters and the exterior of the vehicles do not have the kind of damage consistent with blasts caused by bombs dropped from the air," a statement from the defence ministry said. They added a wrinkle by then noting a US "Predator" drone was flying over the area at the time (RT report). This needs assessed. The alleged track is shown at right (how to read it is another story...), and one supporting argument of potential value is considered below (see also ACLOS talk section). However, most media and western government sources insist airstrike is evidently true, and it must be Russia or someone they're the bosses of. Some have noted as suspicious how Russia had a surveillance drone to monitor the cease-fire, that happened to pass over the convoy as it sat parked -Elizabeth Tsurkov tweeted how "Russian drones w cameras followed the convoy's movements." She implies they were tracking to kill, but then they released the video proof of their plot. The scene: the Syrian Arab Red Crescent (SARC) convoy of some 30 trucks set out from government-held west Aleppo, headed southwest into Islamist rebel held territory, which starts almost immediately past the city. (time: around 11:30). They passed through Khan al-Assal and Kafr Naha, and at least some of the trucks arrived at a warehouse about two kilometers further west, just east of Urm al-Kubra in the early afternoon. They remained parked there until nightfall, when the attack occurred. 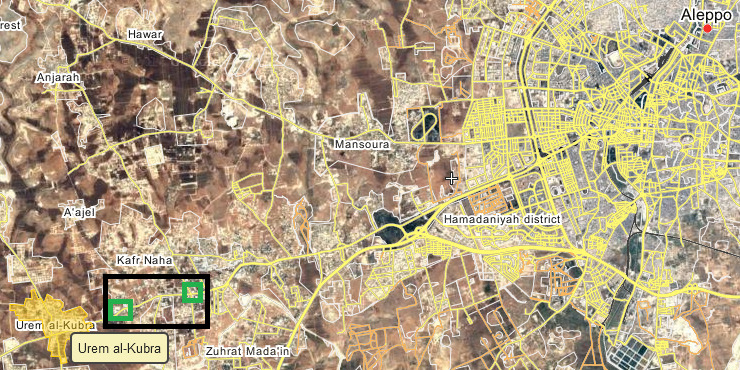 The map below shows where they were seen driving through Kafr Naha and where the attack happened. The left-hand image shows the parking-attack site. The sunlight there is at an azimuth of about 225 degrees, which equates to a time of around 1:30-1:40 pm, the arrival time cited (meaning this was their source). They were clearly parked on the side and not moving. 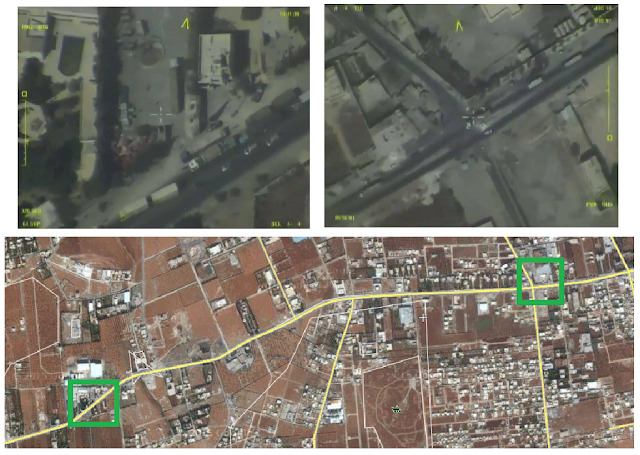 various clues in daylight images compared to satellite views make it clear this is the same spot the attack happened, referred to as a center of the Red Crescent (or "Syrian Crescent," but not "Syrian Christains" as some have heard...). So they-were still parked at 7:30 or so when the incident happened. 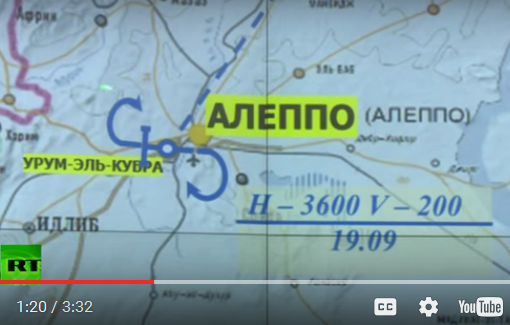 The destination known to the Russians at 1:40 was the same spot they would be attacked. So they didn't "track" it with the one short span, but it didn't move after last seen. So the Russians did know where it was, although they might not have known they knew it. Their jets could likely confirm this just before any attack. It's not an issue. If the Russians were for brazenly murdering aid workers in a crime they could hardly deny, they could have easily found the target. It's plain disturbing how that doesn't register as an "if" to so many. "Of course Putin would do that, and obviously did!" Who decided to keep the convoy there, only partly unloaded by nightfall? Local authorities, of course. They say about 12 people were killed, and about 18 wounded but lived, and probably a few unharmed in the attack. There should be some 31 drivers, any workers who came with them, any loaders sent by the local authorities, and whoever else. 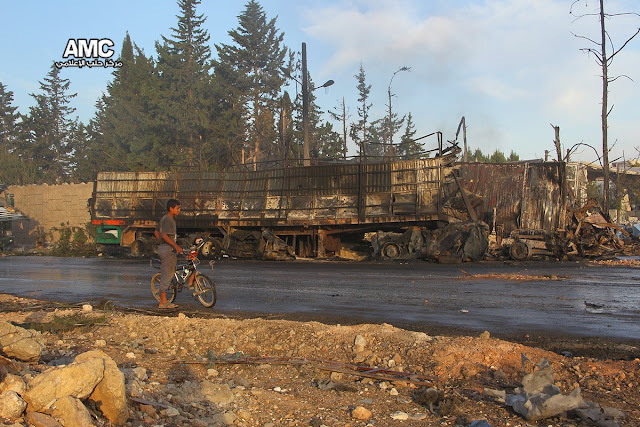 Only about 30 people impacted, when all trucks were torched, some distorted and some torn by shrapnel or bullets ... a very deadly scene, but not a lot of deaths suggests not a lot of people. This might be a small crew, making unloading slow. 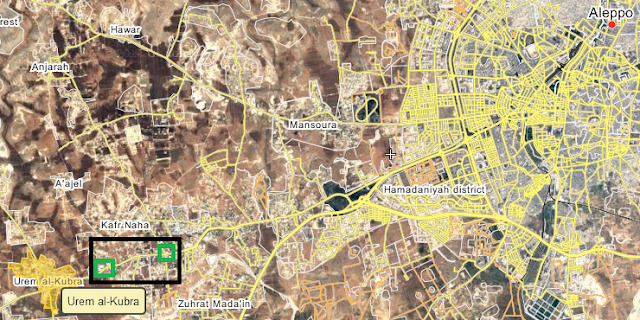 Foreign-supported, anti-government, Islamist rebels administered this whole area, and helped set up the circumstances. Did they and their allies set up the rest of it as well? The location would be known to that Russian drone, and to any Russians who mattered. But it would be even more surely known about by FSA-linked Islamist false-flag units, to every terrorist with a mortar or rocket launcher in the area.So, we'd better hope there's finally some real proof it was something flying that did it. But the terrorists and their supporters were clear it was a jet/helicopter/both, from Russia or Syria or both/whatever/not us. Uh-huh. Hell, they could have just raided the place, robbed and executed the aid workers, torched the trucks, and lobbed a few shells on it afterwards. Hypothetically. We're still waiting to hear survivor stories, from verified witnesses, allowed to speak (unlikely). And besides, all of them would pass through White Helmets hands first. Incriminating videos could be deleted from their phones, etc. 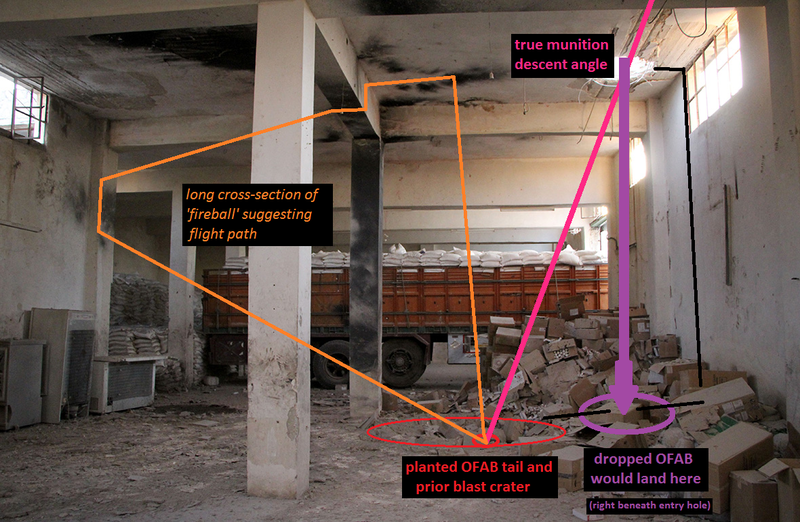 The order of attack seems to be: alleged barrel bomb attack from helicopter -follow-up alleged attack by jets. A basic night-time attack video sees fires already, then two two powerful blasts, preceded by a whooshing sound, followed by ambiguous cries of Allahu Akbar. That could be a jet sound, real or dubbed in, or a rocket sound, perhaps. I'm not expert enough to call that point yet. That's evidence, but not proof, at least to me. Unlike video fakery, audio forgery is very easy. There's still no video for the helicopter part that first got the trucks burning. That would be harder to fake. Further video and another video shows continued explosions, with no discernable jet sounds, and still no helicopters. Analysis of the scene and damage is not cited as a reason to blame an "airstrike." It seems unneeded, with all the unexplained total proof they must have. But people are looking. As Russia's MoD noted, and we at ACLOS so far agree, there doesn't seem to be a single crater in the available images, from an alleged 2-4 barrel bombs plus jet missiles. The road seems unnaturally smooth, as well as wet. It's seen being bulldozed a bit, and sprayed down with water for no clear reason. it seems filled-in and re-graded by morning, making it hard to read any craters for direction of fire, etc. Further, Moscow is apt to note simply fire seems to be an issue. It's odd how most trucks, at least those along the highway, just completely burned - this could be from the attack alone, or precede it, in a similar effort to destroy evidence. There is plenty of evidence of shrapnel damage, and some pressure-waves of a powerful blast, but no signs of any barrel bomb or other munition remains. They'd say these were gathered as evidence, which actually ruins them as evidence. They'll have something they blame.It'll it their claims. Who knows if it had anything to do with this attack. 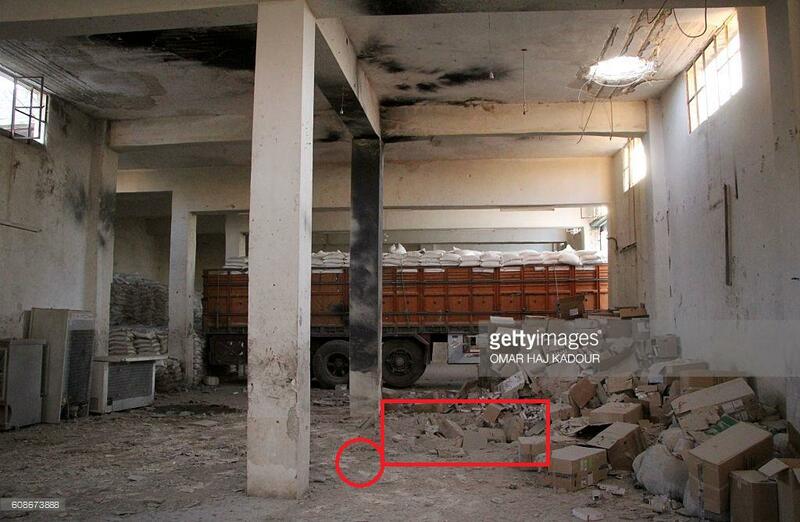 This photo shows an area of shrapnel marks that will be analyzed.Etc. I plan to come back with a part two for this when there's some findings. They may be small, or not. We'll see. 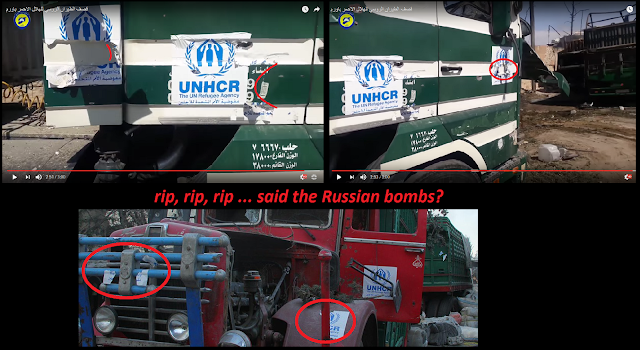 In a statement issued late Monday, the State Department said, “The destination of this convoy was known to the Syrian regime and the Russian federation and yet these aid workers were killed in their attempt to provide relief to the Syrian people.” They don't and can't explain how Russia's awareness was supposed to equate with total protection - they have no say over what the US-backed terrorists do or don't do - this only works with a complete presumption that it was an airstrike. To me, so far, this seems to be a completely unfounded - and thus criminal - presumption. The motive was revealed by another unnamed US official recently. In a candid comment to the Daily Beast, that person said the United States had "helped" the OPCW uncover "on its own" evidence for Syria's alleged use of chlorine gas, which the agency then did. This was done, the intelligence official said, “to work through the slow UN process, get the Russians to a place where they’re cornered diplomatically,” into abandoning support for the Syrian government. This latest move fits that profile splendidly. A convoy full of aid and aid workers is blown to bits. So long as we presume it came from the air, and it couldn't possibly be anyone on the US side ... Russia is held to accou8nt. If they did it, they're to blame. The only other option ... left as an option! Those were Syrian SU-24s, and Russia admits Damascus is bad, and abandons "Assad" militarily, and starts helping with the desired outcome of regime change. How's that for an attempt at getting the Russian "cornered?" We finally found a crater, but it's inside the warehouse. 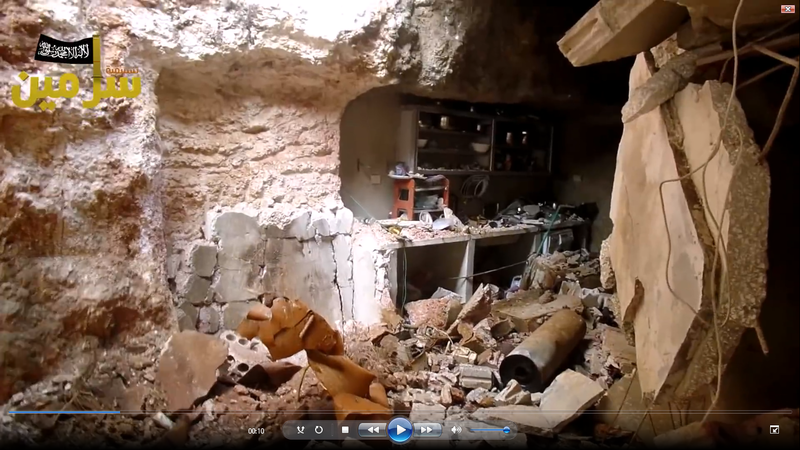 It's got a tail assembly at least of a Russian bomb, OFAB-250 model, and it's below a neat hole in the roof. 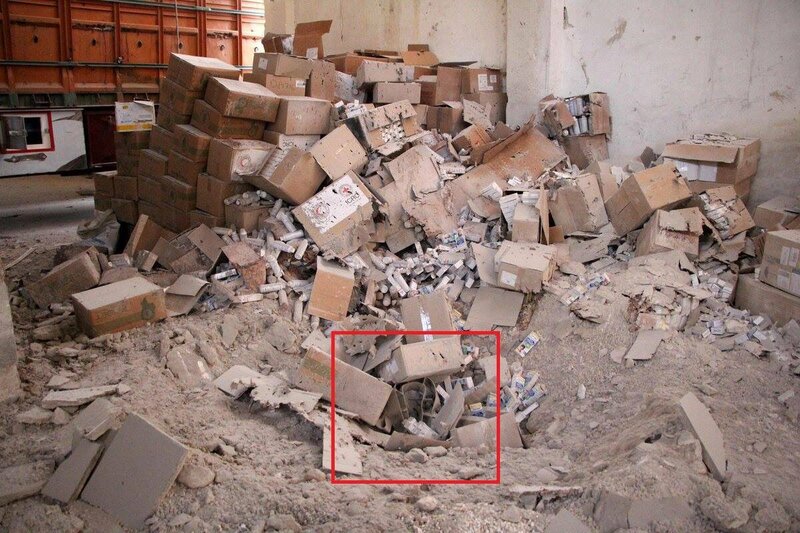 But it's also in a crater of a smaller weapon (too small a crater if this bomb detonated, and too big for it didn't) and it's right next to a pile of lightly damaged cardboard boxes - that seem shredded by shrapnel from a very different weapon. - Other damage clues seem about as they were - general fire and minor damage, some pressure waves suggested and surrounding damage connected. I'm mapping the scene and getting a feel for how many different blast centers of what types we might be seeing. Conclusions, if any, at a later date. - Predator drone - an interesting argument lodged as a comment at Moon of Alabama was elevated to an article at the Duran for weapons used being a match for a Predator - sparkling detonation suggests Metal-Augmented Charge (MAC) Hellfire AGM-114N - I can't confirm this yet, but the ACLOS section should be worth watching. One point worth noting here, from the comments of "PavewayIV"
- An apparent lack of surviving witnesses may prove a central point. 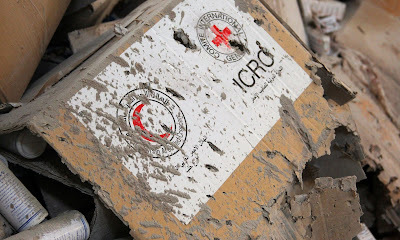 First it was said just one Red Crescent member, the director Omar Barakat, died, and about 10-12 other non-SARC people. Later it was said several SARC prsonnel died, among about 20 people total. 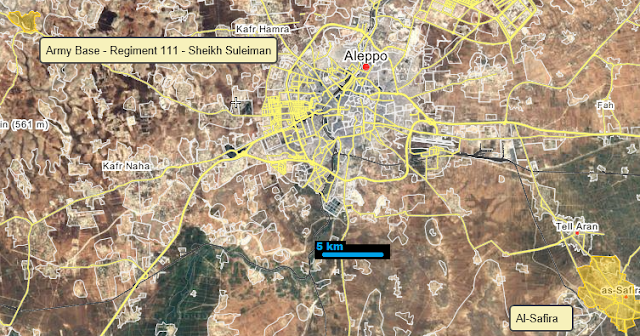 Then the FSA alerted us 31 had died - 12 SARC members and 19 "civilians." It seems almost like everyone died in the attack or died later, before getting to tell their side of the story. (talk section) This might not be the case, but it remains disturbingly possible as we still hear nothing about the survivors or if there were any. All cited witnesses are of the White Helmets variety, responding after the fact, or one vague "aid worker" who sounds exactly like them. I'm looking into this, hoping to contact the SARC directly. According to a handwritten ledger kept by the Red Crescent, the youngest victim of Monday’s attack was 16-year-old Taqi Hashim. Five of the most grievously injured, including a 14-year-old, are from one family, the Najeebs. But I could find no other reports mentioning Taqi or the Najeebs, in English or Arabic spellings. I'll be asking about this "handwritten ledger." This is the first I've heard about wounded but living people, and it includes the kind of 'several men of one family' so often killed all at once by 'regime shelling' in rebel-held areas. - SoS John Kerry trying to twist Russia's words to look crazy makes him look foolish, with his "parallel universe" and "spontaneous combustion" comments, then echoed as Russia's own loony claim (see here). Sept. 6 Fatalities Seen on Video? 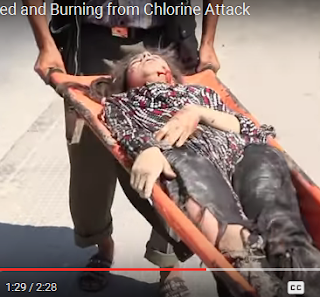 Syria Chlorine Allegations: Sept. 6 Fatalities Seen on Video? The latest alleged chlorine attack in Aleppo was almost two weeks ago now, on September 6 (ACLOS page). Barrel bombs are blamed, reportedly dropped from a helicopter in broad daylight, around 1 pm (usually it happens at night, making video impossible, but so far I've seen no videos showing this drop either, nor even the gas cloud afterwards). These were said to said to hit the rebel-held Sukkari district, at least one barrel releasing what seems to be chlorine gas, said to have affected over 100 people and killed two. This came as a reminder a week after the UN-OPCW report with its terrible flaws had blamed the government for at least two helicopter chlorine attacks. And it came about a month after Islamists in Sukkari reportedly fired chlorine gas on government-held area(s) of Aleppo, killing at least 13 (ACLOS). Briefly, here's the science of it for an idea what to look for (feel free to check here for an indicators list and for supporting source material to explain): chlorine gas turns to acid (hydrochloric and hypochlorous) on contact with water. So moist tissues of any animal will be attacked, causing anything from irritation to outright melting as the victim is hit with tiny droplets of acid on the skin, in the eyes, in the nose, throat, and lungs... bad news. Skin can be irritated or burnt, especially in tender or injured areas. It causes eye damage, starting with watering and redness and proceeding to worse. Lungs and airways are damaged - painful, shallow, strained breathing (dyspnea) results - later the tissues bleed, and later yet protective mucous forms, one or the other often suffocating the victim fatally some hours after the incident. Changes in blood chemistry lead to cyanosis, a color shift to purple and then blue, especially notable in the fingernail beds and the lips, but sometimes visible all over the body or localized. 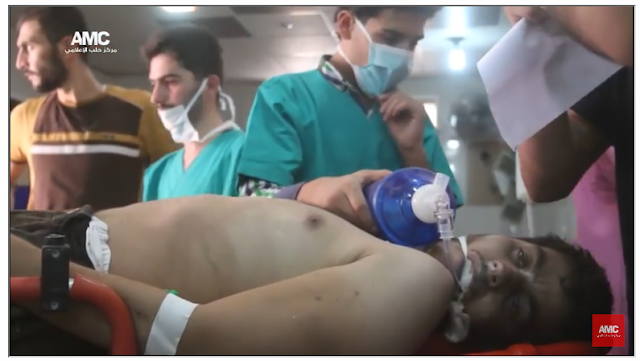 Two civilians killed by the chlorine attack were reported by the next day - a man who had died right after the attack, and a teenage girl who died "overnight" or on the afternoon of the 7th. To my knowledge no one has shown videos or photos of either victim as that ("here is an image of..."). But it's pretty likely both are shown (unnamed) on video, and analyzed below. If these are the fatalities, it would reflect badly on the allegations (which would be nothing new, of course). As the ones who died, these should show the clearest chlorine indicators of all. But they come out just as weak as most. Note: There are no "fascial bones." There is "fascia," which runs body-wide under the skin, but it has no bones. But there are facial bones, of course, in the face (A Times of Israel report corrects this to facial, while most other postings do not). So to clarify, her breathing was complicated by a smashed face, caused by the physical barrel bomb impact/blast or after effects (or so it's being reported). But the actual chlorine is what finally killed her. And it did it realistically, as described. Clearly, video confirmation in this case should be unpleasant and bloody. On the Ground News (English-language roaming Islamist propaganda "news" source) may have video: site report, September 6. At 1:26, arriving at the clinic with an affected man, they record a girl of about 13 brought in on a stretcher, with facial injuries - seeming alive but in pain, quiet, tense, and still (gripping the stretcher). I apologize for this, but this might be the girl who reportedly died, and this brief glimpse might be of interest to the global public and to the family of this victim. The story may not be true. Notes: she has strangely torn clothing (pants partly shredded with no injury seen beneath, flimsy shirt seeming intact). She has a light coating of dust that could suggest some explosion, but mainly on her pants and not shirt. Nowhere on her clothing do I see blood suggesting any serious bodily injury. On first view (at right) the girl's face seems intact but red and swollen on the right side (our left), with blood under the chin on and perhaps into the jaw area on her left side. That could be a serious wound or not - it's hard to say. There doesn't seem to be any blood from it on her (replaced?) shirt. Other injuries are unclear but seemingly minimal or non-bloody. Burns, stains, and/or abrasions on her left hand is all we see. As she's carried by, we then see the girl in profile, and her face again seems to be intact and not smashed. However, on her left cheek is an irregular, scarred-looking patch and what looks like a large hole deep into the bone, but with no blood - almost like an old wound that's healed. That seems to be related to a swollen area down into her jaw - like a wound-related infection. Is it a coincidence the barrel bomb apparently tore into her other jaw, of all places, after that had gone on a while? If all the injuries were fresh, this might be called a likely gunshot through the face, from right cheekbone to left jaw. But it seems one injury is old, and the other fresh, but unclear. Out of a pool of around 100 people, there shouldn't be very many girls of around 13 with serious facial injuries, old or new. So quite likely, but far from certainly, this is Hajar Kyali. The strange injuries support this in another, roundabout way: people in abusive detention are likely to have horrible injuries that are poorly treated. So she could be from some abducted Alawite family, for example. She is exceptionally thin and might be malnourished (clearly another sign of captivity), or just ill from the infection. And prior research has shown hostages/human shields like that are often, or maybe exclusively, selected to die from alleged regime attacks like this. So ... if this is the girl who died, chlorine probably has nothing to do with it, unless she was gassed after arriving at the clinic. This is actually possible, but not the kind of thing we should presume. More likely, she would be suffocated or overdosed on opiates or something (as with the 2015 Sarmin chlorine attack, and perhaps see below). Some first-day reports mentioned one fatality, while most did not. The first of two to die was an adult man. British ITV news was told the male victim was Mohammad Abdulkareem Afefa, age 29. 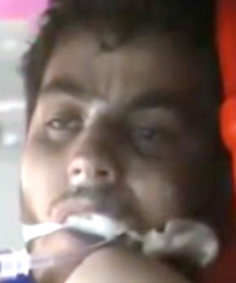 SNHR at first "documented the killing of one individual, Mohammad AbdulKarim Afifa." AP heard "a 29-year old man also died from respiratory failure." Usually, a chlorine death is described with "suffocation," not a breathing "failure." The victims don't fail, they try hard and score A+ but they die anyway. To score an F in breathing suggests something else. This could be a minor semantical issue, or something more. A man of perhaps this age, unresponsive and perhaps dead, appears in a video of he 6th, seen for a long time at the start.Ample daylight comes in a window, so it can't be very many hours after the mid-day attack. This man is quite likely already dead or, if not, then comatose. He never moves or blinks that I noticed, or even visibly draws a breath. He just stares into space as a doctor tries ventillation with a pump, and another draws a blood sample from his neck. Appearing roughly 29 and likely dead or nearing it, I would venture this is most like the same man reported. If so, the visual record clearly matters. So here's his face contrast and gamma enhanced at right. So this man who might be the other fatality, even more clearly than the first case, shows no sign of chlorine exposure, and shows instead contrary and roughly opposite signs. These are very like the signs shown by the Taleb family babies seen dying in March, 2015. This is most consistent with a CNS depressant overdose (barbiturates, opiates (morphine, heroin, demerol, etc.) - again, as linked above). Passed off as chlorine, we could call this a "chloroin" overdose if it keeps coming up and begs a nickname. Mr. Afifa doesn't seem to be malnourished or suffer any other clear abuse or neglect consistent with long-term captivity. He might be a recent capture, or some other kind of person who somehow stopped breathing in the Sukkari district that day. Neither of these identifications is absolute or equivocal. But both matches are quite likely, and between these two probably at least one and likely both reported deaths in this incident were simply passed off. They would be claimed as chlorine victims, in defiance of the physical evidence that something else (covered-up) actually killed them, here in this "liberated" corner of Syria. On August 28, the Syrian Network For Human Rights reported: at least 2 women died in government warplanes missiles fired on Al Rastan city in Homs governorate, August 28, 2016. No further details. One woman is shown in a photo, sort of crushed and rolled to the edge as two concrete slabs came together in a building collapse. Presumably, the story is she was living there, as the dishes suggest, and when it was bombed, everything just came out like this. She might have been living alone and/or "in sin" to some - no dead husband mentioned, and look at those modern, tight pants, with spangles. She wasn't a real salafist, apparently. And that bright pink head-scarf ... or is it red and white pin-stripes? Or tie-died? 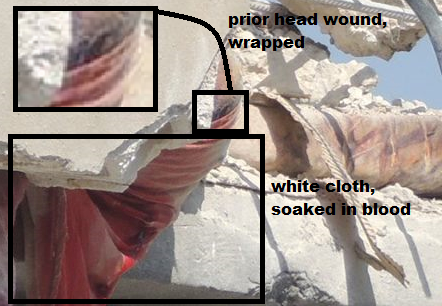 Looking closer ... beneath her head scarf is a large head wound we can only see part of. It seems fatal, and to be done while the scarf wasn't on - the fabric doesn't seem torn like her head is. And the color issue is all white cloth plus blood. It's possible this is all from the jumbling violence where some reinforcing bar pierced her skull while the scarf was pulled back, and then later the it slid back to partly cover the wound. But it's also possible she was shot or stabbed in the head, had that wrapped up with a new headscarf, and her body was placed in some abandoned building - probably with its walls already gone. It might be arrayed with some dishes, all visibly along the edge, before the structure was collapsed on her body as a propaganda stunt. I think that's quite likely what happened; they just planted the body of someone they killed, because they're terrorist assholes. They figured it would all come out looking close enough. In case we get an alleged attack time here, note: photo is mid-morning (could be measured for solar elevation). Most blood is dry, but there was a lot, and the thickest of it is still tacky. The possibly blood-smeared object to the right is of some interest. I don't know what that it - some kind of mattress? Who was she? SNHR had said "at least two women" killed, suggesting both more people and more women were possibly killed. VDC query: all civilians from Rastan killed Aug. 28 = 1: Ayda Hamdan, adult female, married, killed by warplane shelling, and no further details. The entry includes this "generic video" of others being treated in a clinic in Rastan for genuine-seeming but light injuries. There's no second Rastan woman. 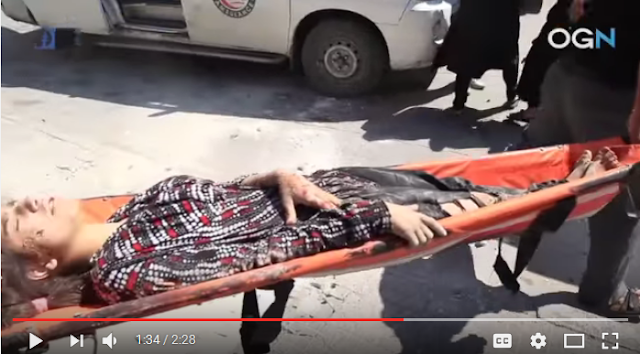 But there's supposed to be another woman.... VDC shows a total of three women from Homs province dying this day. 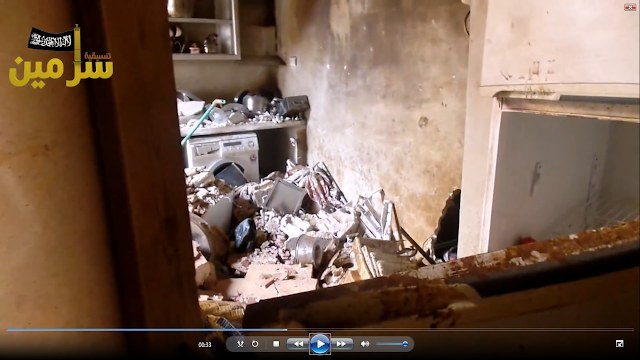 And this same Rastan video is attached to one of those, from Der Baalba, (northern Homs city), killed the same way. One could presumes she died in Der Baalba, but warplanes don't shell there much. Was she displaced somehow, to Rastan, to then die along with this other woman? VDC query: all Der Baalba deaths on 8-28 = 3. That woman, and the other Homs woman, and her husband. So that's presumably one of these three women we see squished here. The married couple share the same family name al-Merei ( المرعي ) - suggesting not very traditional Islamic people. Women usually keep their fathers' names if devout Muslims, so the father and the children have one family name, and the mother has another. These kind of "Western-style," all-one-name families fare poorly for things like getting displaced within rebel-held areas, and then dying elsewhere under alleged Assad bombs in the kind of ignored, daily mini-massacres that really add up over years. See also Hayan Missile Massacre recently, near Aleppo: 2-3 wives with the same name (Qraitem) as 5-8 kids killed alongside them, and same as 3 men killed all at once two weeks earlier (all sorting and killing was, of course by regime aircraft...). In this case, however, the man and woman are listed together, not separated like usual. Any children, however, seem separated and not dead. They're supposed to be spared, and can be re-educated. Also, I checked the name Marei, and it doesn't have much of a clear pattern - no recent child deaths, one man from Halfaya the next day, one man each from Aleppo and from Rastan and one that's a "FSA" rebel, in the preceding weeks, etc. But back to the Hayan case - that connected by one Qraitem man and many from another family killed earlier, in a June 4 barrel bomb attack with a boy somehow crushed between a concrete slab and a section of demolition chute. 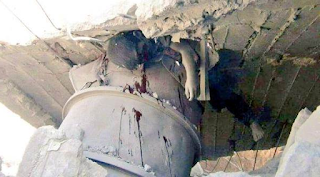 How that could happen is unclear, but some turned the photo upside-down to claim he was crushed by an un-exploded barrel bomb! Note, blood clearly drips down. But not much of it. He was probably dead well before the slab came down. Someone laid his body across the chute, after the massive wound across his upper face wasn't even bleeding any longer. Only when the slab came down was a little thick blood up in his sinuses jarred loose to make this splatter. Turning horribly-executed women and children into more victims of "Assad's" bombing ... it's that easy, or usually, even easier. In fact, this is one of the more elaborate methods I've seen. 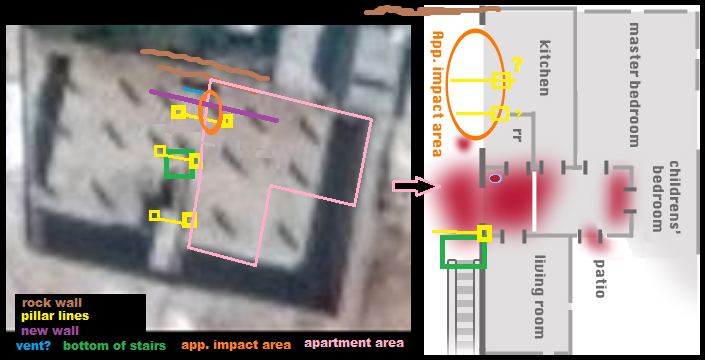 As part of a sub-investigation, here's a space for site correlation regarding the alleged Taleb family home in Sarmin where chlorine gas was generated on March 16, 2015. 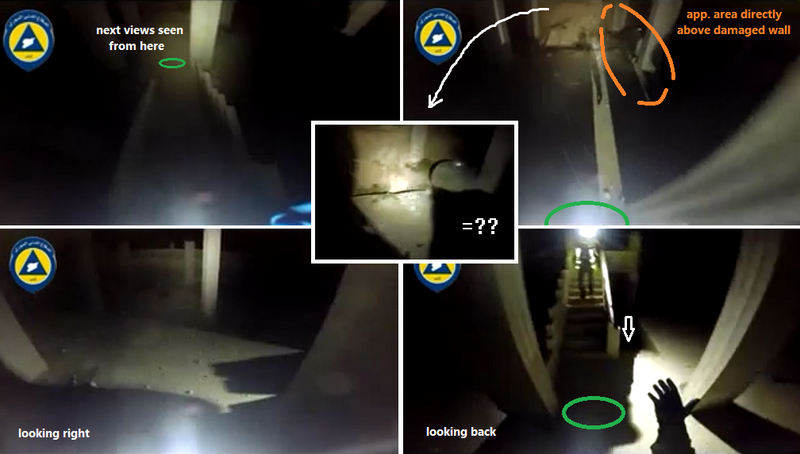 From earlier, here are some lightened screen captures of the upper level, from the 9:00 civil defense night video (Youtube). From the elevated walkway looking across the unfinished main floor (pillar with no roof). Then the views down the stairs, onto the main level, looking right, and looking back. Orange-marked area is approximate - apparently behind the mystery structure, which we'll consider below. The stairs down to the basement level are indicated with the white arrow. We never did geolocate this, but OPCW investigators were given a location for the siite, besides the first alleged impact of that night in a nearby field. These are shown on a map in their October, 2015 report (via The Trench). The northernmost pin is the one of interest. Coordinates are given: N 35.903257° E 36.729642°. That points to this building on Wikimapia. It's on the east edge of Sarmin, right next to Abdo Salama school. (It's worth noting schools are often used these days to house displaced people or prisoners, but this doesn't seem like an annexed execution site so much as an inhabited home with children). There are a few uncertainties about the match, but as we'll explore it, it's a pretty likely fit. At right is the best view from Wikimapia, date unclear. The night video would show then entering from the south side. There seems to be an elevated road here, and the ground dips down to the north. They cross the walkway, and there are stairs down on the right to the open main level. Night video shows columns apparently 3 rows deep from top of stairs. The pillar on the right at the base of the stairs is not aligned with the next one north - that's a site match. Looking right: 2 pillars, then a wall - site match. That's not very certain; it's a vague place. Site history, from Google Earth imagery: it was a vacant lot on July 20, 2011, but was dug out into a sort of a pit by December 5. Structure as seen is mostly done by June 13, 2012, little changed since, up to the last image shown - August 25, 2014 - it's now more than 2 years since an update. Below: 7-20-2011, 12-5-2011, 6-13-2012, undated view from Bing Maps. The December view helps establish some kind of dug-into-a-slope situation, and gives an idea of the depth between the elevated south road and the other sides. In the later views, note the dug in area along the west, and apparent gap for air and light along the south, running beneath the walkway. The south side and maybe even the north might be sort-of hacked into the ground. The east end is unclear. 50. A ballistic expert analysis supports the statement of the witnesses, improbable as it sounds, that the device impacted through the ventilation shaft. There is a pale whitish mark on the right side of the shaft, which is likely the impact mark. - one slot visible in the middle of the north edge in most views. marked A. Dimensions: App. 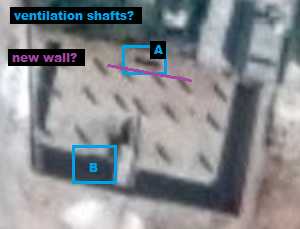 2.5 meters long, perhaps one meter wide, or perhaps a bit bigger (glare effect) - too small, presumably, to expect a barrel bomb to fall through, but close to what's described. - Google Earth views of August 23, 2013 and August 3, 2014 suggests a larger square hole to the left of the south stairs, usually hidden in shadow. Marked B. Dimensions: app. 2.5 x 2.5 meters. But this doesn't seem to line up so as to be relevant. That's all satellite views suggest, but 7 months passed between the latest image and the events in question. 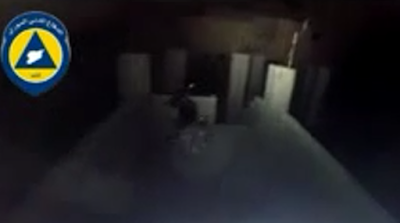 Video suggests there might be a new addition as of March 2015. The 9:00 civil defense night video, at 4:58, passes over something that seems vertical, some slab, with a gap at the base that seems like a cut in the concrete - with some kind of canister on the right, a little past the second pillar line in. This is the big mystery of the scene so far, marked ??? in the middle of the second image at top. Apparent location marked C? (was too far in) This would run quite near the north wall, but seems a bit too close to be that. As it turns out, this is also about where the vent or hole should be, and also pretty close to slot A. No hole and no slot is visible - unless that cut is the slot, here plugged with a vertical slab ... otherwise, what the bomb fell through is on the other side of that vertical mystery thing. 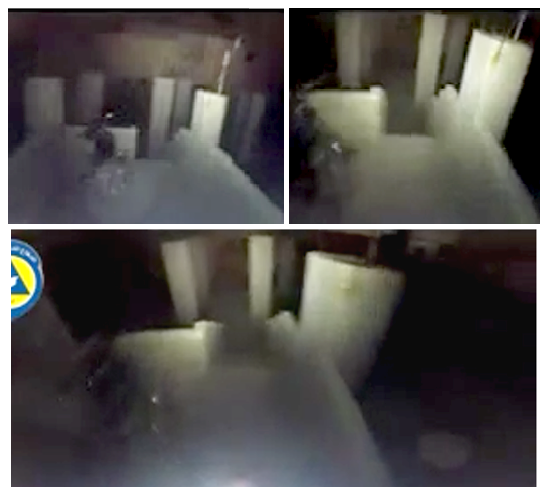 Zooming back, at 4:42 we can see the workers heads silhouetted on what seems to be the same wall just past the second pillars (upper left view of top image, and here again at right). It's big, running at least the span of the purple line above. It doesn't seem to be any building to the north - there isn't one that runs all across, and this seems too close. It looks like a wall finally going in for the home, but it seems to rise higher than the pillars, and to not be based on them either, as they usually should be. Is it a giant ventilation shaft? Or a wall? This could provide a higher ceiling here but an uneven floor above. There could even be a roof there and livable space already - with a shaft or blown hole just on the other side of the wall. The hole/shaft is never seen from the underside either, that I've seen. Photos and videos taken in the basement don't seem to look up ever. All we can really see is that a lot of direct sunlight pours in. It's either a wide shaft with short walls, or a large hole. Next-day site video 1. Screen grab below. Kitchen wall: unclear burn marks at top, neat hole punched in one spot, right at the bottom, and no other serious marks. This is possible, but strange. Is this just from the impact of a falling barrel hitting just outside the kitchen? At floor level like that, it would let the heavy chlorine gas seep into the mater bedroom - but that already had purple pools of precursors just outside the door. in the hall.